I haven't done a lot of digis on kraft paper... I find that when I see it done - I know I need to try it! The image Topiary 1 from Scribbles Designs colored with copics with some white gel pen accents complete this very CAS card. The sentiment tag was a simple cursive lettering tucked in behind. I do love the 'Dancing Papers' as each piece is so very unique; it is from my copious paper stash and I'm not sure if it is available any more. The borders around the image are again from my paper stash which even though I try to use something from the paper stash drawer, I seem to accumulate even more. Hmmph! 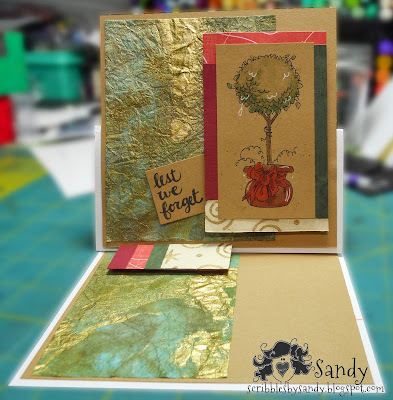 which is to create a card or project with the theme... Remembrance with option of a fancy folds ... and there is even a freebie to use if you don't have a Scribbles Design's image!!! Yay! You can enter as many times as you like with a SD image - just put SD behind your name (see the updated challenge rules on the blog) and now you can also use any other designer's or companies image - although you are limited to 3 entries only. The gold papers look fantastic. The image is very pretty to and fit the theme so well. Wonderful card Sandy! and no, I've not forgotten you! I miss you and the team, but life isn't slowing down. I hope you have a beautiful day!